Heavy pre-monsoon rains that lashed the city was welcomed with a delight by most Bengalureans on April 17. 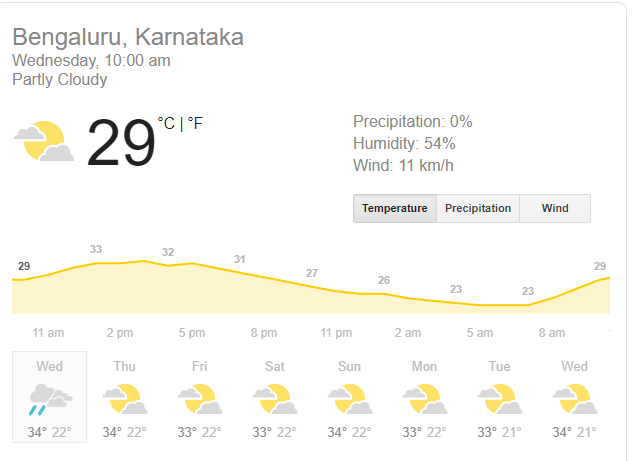 Bangalore rains playing a cameo with just hours before the Lok Sabha elections also contributed to a rapid fall in temperature. A dip of more than 12 degrees was recorded in about an hour’s time as mercury level fell under 20 degree Celsius late in the evening. Arrangements at polling stations have reached final stages. District Electoral Officer N. Manjunath Prasad held inspections to oversee poll-related work at several centres around the city. Polling will begin at 7 am on April 18 in 477 booths, 242 in Bangalore North, 113 in Bangalore Central and 122 in Bangalore South, and will go on till 6 pm. As many as 90,997 police personnel will be deployed across the state at all polling booths. The police department has identified 11,992 booths as critical in the state and has deployed extra security forces for these booths. The poll panel in Bengaluru has received at least 300 complaints from citizens about mismatching voter ID and wrong listing of names and residential addresses, complaints include celebrities like former cricketer Rahul Dravid and Kiran Mazumdar-Shaw’s mother Yamini. If you are planning to fly out from the city, Kempegowda International Airport will not serve alcohol till 11.59 pm on April 18, on account of the general elections. Team Express Bangalore brings update on top news, traffic and weather updates from across the city. Keep tab for latest Bengaluru news. Travelling through Rammurthinagar - Kalyan Nagar or Malur-Byranahalli Road? Your journey might eat up several minutes off from your evening as traffic there is at a snail's pace there now. Find an alternate route or plug in your earphones to enjoy some good music, provided you are not driving. Power supply is hit at several areas of the city as electricity feeders tripped. Areas hit: Jalahalli, Abbigere, Ganganagar, Ashwathnagar, Dollars Colony, Poojari Layout, AECS Layout, Mathikere, Brindavan Nagar and surrounding areas. Power supply is expected to be restored by 7 pm. 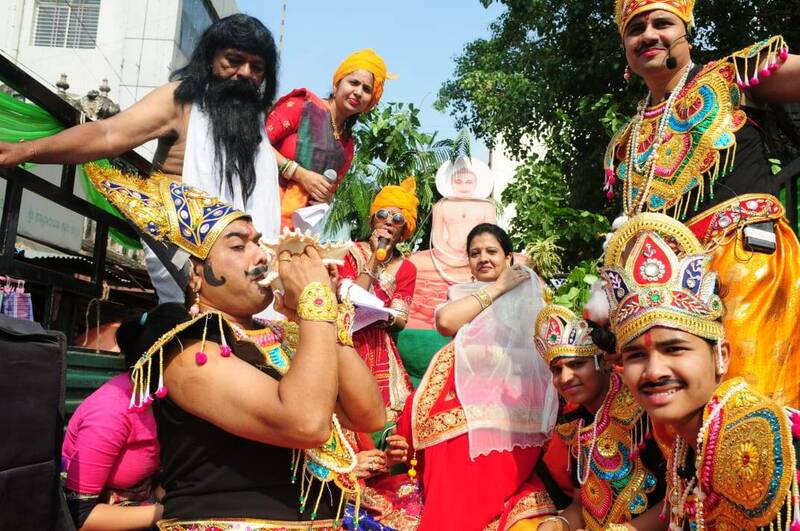 Jain community in Bangalore celebrated Mahavir Jayanthi, cultural activities and procession has been taken out in various parts of the city. From preferring to stay indoors to a sudden desire to go for a walk - Bengalureans' feel saw such a contrast in the last two hours. Several Bengalureans took it to social media platforms including Twitter to express the unexpected relief summer showers brought for them. Bangalore gets light showers. Whitefield, MG Road, Richmond Circle, Johnson Market, RT Nagar and several other areas witness rains. Bangalore Traffic Police (BTP) tweets advisory; asks citizens to refrain from parking vehicles under trees. Responding to the video tweeted by Bangalore Central independent candidate Prakash Raj, Congress' Rizwan Arshad has requested voters not to fall for such rumours. Apparently, some fake news is being circulated about prakash raj's association with me. Request ppl not to fall for such rumours. I hv fought this election on the agenda of development & I hv people's blessing with me. @prakashraaj is an independent candidate & I wish him luck. 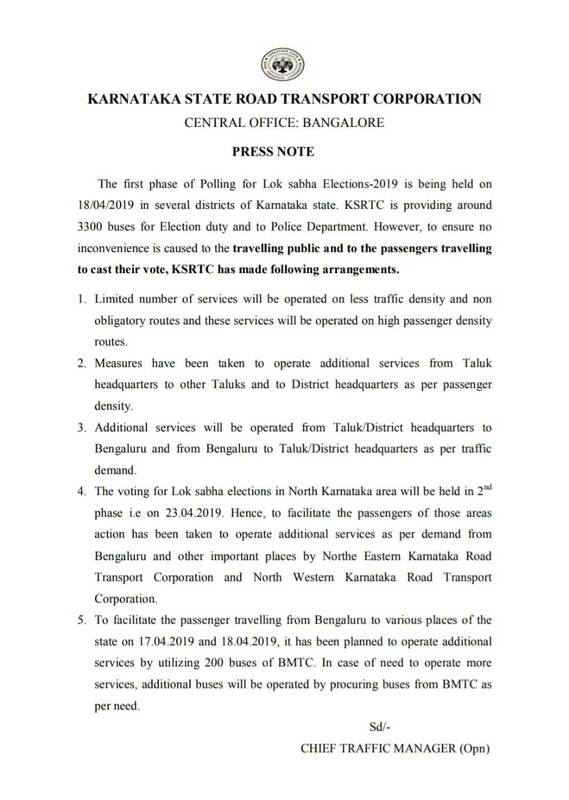 Since Karnataka State Road Transport Corporation(KSRTC) is providing around 3,300 buses for election duty and to Police Department, to ensure no inconvenience is caused to the travelling public and to the passengers travelling to cast their vote, KSRTC has made following arrangements. Fresh controversy sparks as fake video alleging Prakash Raj supporting Rizwan Arshad surface. Just a few hours more for Bangalore to go to the polling booths for Lok Sabha elections 2019, a fresh controversy has sparked after a fake video surfaced on social media alleging Bangalore Central independent candidate Prakash Raj of supporting Congress candidate Rizwan Arshad. Addressing the matter, Prakash Raj has tweeted a video rubbishing such claims blaming the Congress candidate and his aides for sharing the video. As the stage is set for Lok Sabha elections to take place in Bangalore tomorrow, Bangalore Political Action Committee (B.PAC) has observed that only 3 out of the total 78 candidates fighting the polls from the city are women. It also notes that only 27 of the 478 candidates in total from Karnataka are women. Average Air Quality in Bengaluru is Moderate. At 1 pm, PM 2.5 (Fine Particulate matter) is at an unhealthy level if you are near Silk Board or Bapuji Nagar, while it is at moderate levels near the BTM Layout and Jayanagar. Several artists get together and paint on canvas' arranged at the sidewalks of Rangoli Metro Art Centre, MG Road. The exhibit includes open-air installations, graffiti, street arts, sculptures and paintings. If you are somewhere around, don't forget to take a look at them. Bangalore University has extended the last date to apply for all B.A, B.Com, BBM, M.A, M.Com and M.Sc. Mathematics courses under Distance Education programme. 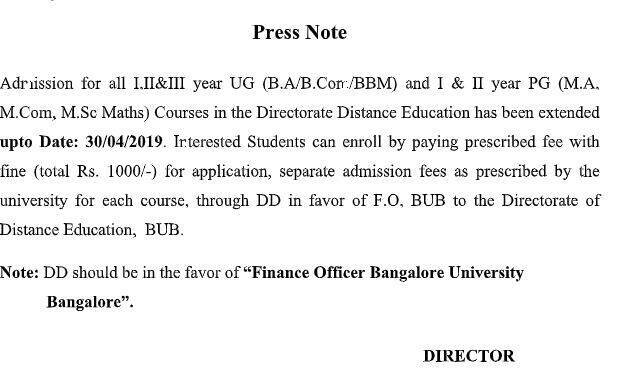 Students can now enrol by paying a prescribed fee (with fine) of Rs 1000 before April 30, according to a notification drafted by Bangalore University. District Election Officer (DEO) for Bangalore Manjunath Prasad holds inspections at polling booths and strong rooms in Ashoknagar and Gandhinagar, ahead of Lok Sabha elections taking place tomorrow. There are five different LS constituencies in and around the city -namely Bangalore North, Bangalore Central, Bangalore South, Bangalore Rural and Chikkaballapur. Bangalore hospital offers free health checkup. How to avail? Go Vote tomorrow. BGS Gleneagles Global Hospital, situated in Kengeri, has put out a special offer to encourage more voter turnout. After casting your vote tomorrow, click a selfie and send it to them. Get a free basic health check. Areas in and around Viveknagar, Ejipura and Austin Town will face power disruption. 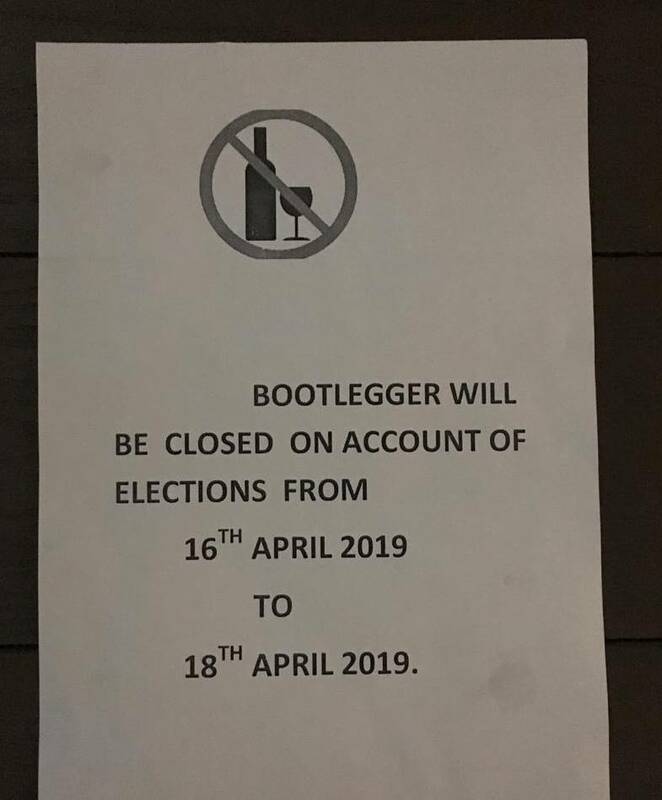 The election commission has declared that no alcohol shall be served/sold in and around Bangalore, in the light of Lok Sabha elections happening tomorrow. Time for next 'Cheers': post 6 pm tomorrow (April 18). No worries, Friday night plans can still be ON! Power to be restored by 11 am. Peak hour traffic is getting heavier on several roads. 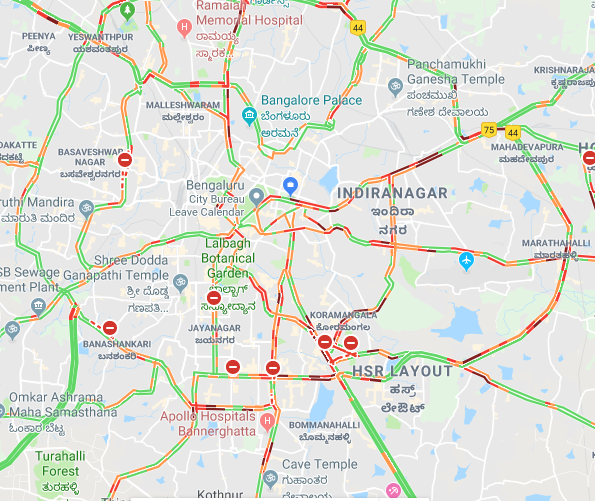 Traffic snarls are reported from various parts of Central Business District, Indiranagar, Banashankari, Bannerghatta Road, Mahadevapura, Hebbal, Goraguntepalya and Yeswanthpur. A study conducted by the Indian Institute of Science (IISc), Bengaluru has found that aerosol loading in city’s air is the maximum on Fridays reports TOI. Aerosols are solid and liquid particles suspended in the atmosphere and include various kinds of air pollutants as well. 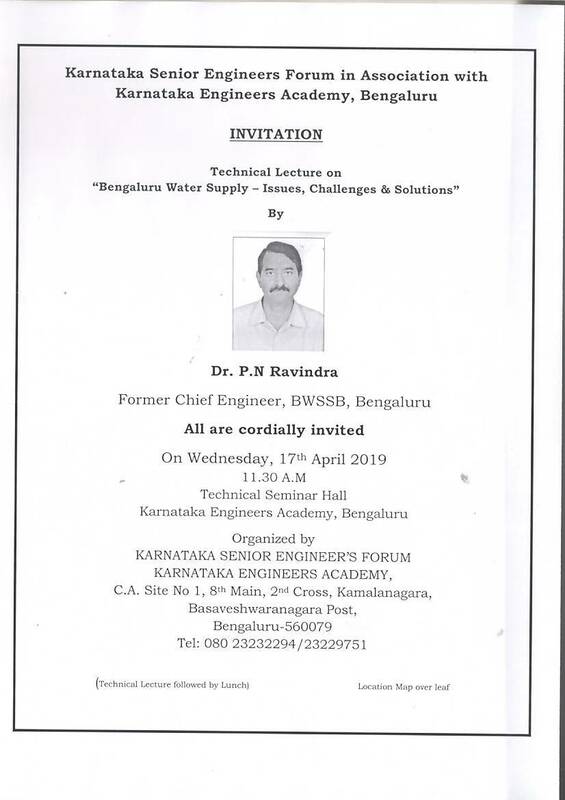 Karnataka Senior Engineers Forum is organising a lecture on ‘Bengaluru’s water supply problems, challenges and solutions’ by Dr P N Ravindra, former chief engineer BWSSB. Venue: Karnataka Engineers Academy Premises, 8th Main Road, 2nd Cross, Kamalanagar, Basaveshwaranagar Post, Bengaluru. Researchers and economists of Azim Premji University, based in Bangalore, has proposed an Urban Employment Guarantee programme that can create employment opportunities for up to 50 million workers in small towns across the country. 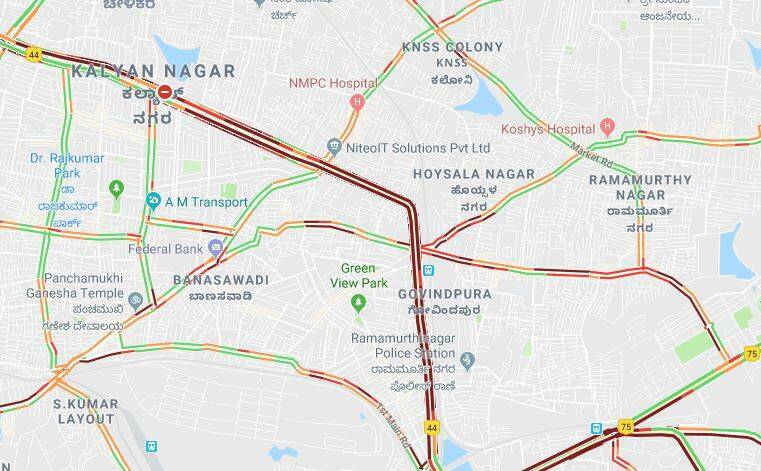 According to a recent tweet by the Bangalore Electric Supply Company Ltd. (BESCOM), power has been disrupted at Bhuvaneswari Nagar, Sultanpalya and Kavalbyrasandra due to High-tension wire cut. Power supply expected to be back by 9.30 am. Assistant commissioner of police Raviprasad P of Yeshwanthpur sub-division, and police inspectors Shivareddy of Jnanabharati police station, VT Srinivasa Peenya police station and Mudduraj Y from Yeshwantpur police station have been transferred by EC following several complaints from the public. Average Air Quality in Bengaluru is Moderate. At 7 am, PM 2.5 (Fine Particulate matter) is at an unhealthy level if you are near Peenya or BTM Layout, while it is at moderate levels near the Hebbal and Hombegowda Nagar. The temperature in the city will hit up to 35.4 degree Celsius today. While Relative Humidity is at 38% today, make sure you stay protected from direct sunlight. Stay hydrated and wear sunscreen. Drink water at regular intervals. A 23-year-old student died after losing control of his motorcycle due to an epileptic fit in Dattatreya Circle near Hosakerehalli, southern Bengaluru on Monday. Incident has been reported around 8.30 pm. Abraham Philip, from Thiruvananthapuram, Kerala, fell to the ground and sustained grievous injuries to the forehead. Here are a few contacts that might come handy for you in emergency situations: BBMP Control room: 080-22221188 In case of power disruptions, contact BESCOM: 1912. If the water supply is hit at your area, contact BWSSB: 1916. Bangalore is all set to go to the polls tomorrow, aren't you voting? Check if your name is on the voters' list and where your polling centre is. Here's how: 1. Search with the EPIC (Electoral Photo ID Card) number | 2. Search with name and other details | 3. Search via mobile number. More than 90 lakh voters are on the final voters’ list from five constituencies in and around Bangalore, namely Bangalore North, Bangalore Central, Bangalore South, Bangalore Rural and Chikkaballapur. As part of preparations for the Lok Sabha Elections in the city, Bangalore Metropolitan Transport Corporation (BMTC) and Karnataka State Road Transport Corporation (KSRTC) are deploying their buses. Services are likely to be hit these days as the number of buses plying on regular routes will see a dip. While 1,702 BMTC will be off regular services, as many as 3,314 KSRTC buses will be on election duty. Meanwhile, flying out of Bangalore just got expensive. As a massive hike of 120% in user development fee was put in place by the authorities of the Kempegowda International Airport, the same is expected to affect airfares of all domestic and international flights from the city.